The balcony is a very flexible space at home. You can use it as a reading corner, an additional living room, an extension of the dining area or a storage room for your other things. That’s why it is best to maximize this space if you have one at home. With a little creativity and use of storage solution tricks, the balcony can serve your home better. Ask your trusted carpenter to create a bench for your balcony that has a secret storage compartment. You can tell them to make a removable lid so that you can keep extra pillows, magazines or even cleaning tools stored and out of sight. Go for a seating and shelf combo. Are you into gardening? Display your potted plants and flowers on your seating piece with an overhead shelf. Use the shelf to showcase mini pots of succulents or herbs that you planted. They will surely make your balcony look and feel more refreshing. Try using wood slats so that you can put rods and hooks to be able to place more planters. 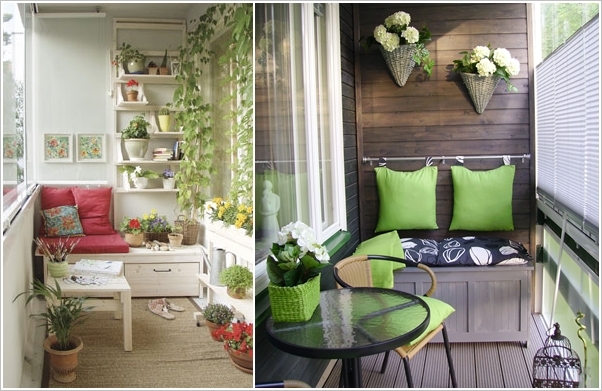 Make the most out of your balcony space by creating an industrialized looking shelf. You can achieve this look by using wooden crates and industrial pipes. Do a floor-to-ceiling shelf to take advantage of the available space in this area. You can put your favorite books, décor or even small plants to make it more beautiful. Repurpose your movable coffee table. If you don’t have a big balcony, you can opt to use a movable coffee table instead of making wall-to-wall shelves. Make your own with a few wooden pallets, caster wheels and your tools. Paint your coffee table to achieve a more polished look or keep it bare for a more rustic appeal. Put a tray on top and use the compartment place to keep books, magazines and other items you want stored. Update your old metal rack. Give your old metal rack another life! Thoroughly clean and put it outside. Place properly labeled metal pails or plastic bins that you can use to store and organize common items found in the balcony like tools or toys.